Discussion in 'MacRumors.com News Discussion' started by MacRumors, Aug 31, 2014. Apple's rumored mobile payments initiative appears to be coming closer to launch, with Re/code reporting the company has reached a deal to partner with American Express. Apple was previously reported to have been in negotiations with Visa over the effort, which is said to leverage the upcoming iPhone 6. Just days ago, a logic board leak revealed the near field communications (NFC) chip destined for the iPhone 6 and which will presumably play an important role in enabling the mobile payments functionality. With Apple's extensive database of credit card numbers linked to iTunes Store accounts and new security technology such as Touch ID built into the iPhone, the company is strongly positioned to leverage those assets for widespread adoption of mobile payments. The effort naturally requires partnerships with credit card processors and retailers, but the pieces do appear to be falling into place just ahead of next week's media event. Update 5:19 PM: A new report from Bloomberg claims Apple will be teaming with Visa and MasterCard in addition to American Express for its mobile payments initiative, which will be unveiled at Apple's media event on September 9.
iPhone: Don't leave home without it. Awesome! I love my Amex. people in Germany have yet to adopt to credit cards let alone mobile payments lolol. You know... at first I was against this, as I can see a lot of the negative aspects of it, but the more I see the proposed implementations, the more I like it! Next up, I'd like to see integration with iBank, Quicken, and other financial software. Having two people draining the same bank account is a recipe for disaster without a good synchronization plan. Amex should have Debit card. AMEX rocks. All I carry. Good partnership indeed, was hoping for this. Wisdom comes from making bad decisions. Smart people learn from their own mistakes. Wise people learn from others' mistakes. Can someone smarter than me expound on the "ceiling" of NFC technology? It seems to me like Bluetooth is more mature and better technology, but it has also been around for a long time and evolved dramatically from version 1.0. What can we reasonably expect from NCF technology in the next few years, as it seems this is legitimately payment technology of the near future. I do too and I already have my iTunes account linked to my AmEx so I'm good to go! Can't wait for this and I hope it's widely adopted. I don't have an iPhone 6 yet either! I thought talks were ongoing at a near done deal level with Visa which is a great place to be for international adoption. This talk about American Express though sounds further along than I believed so will be interesting to see which gets mentioned at keynote. It is still very early days though so it will not be a song and dance affair. Most likely a tie in to the NFC announcement which itself I am not expecting to be the show piece. Okay now, that concept is ef*ing awesome ! I can't wait to see how that concept will come out of Apple. At the same time, I find it rather dangerous to always be only "One touch away from buying stuff". Let's hope it won't make my finger heavier. I was thinking the same, altho there is not many places that use NFC in the UK that's outside of London anyway. We still haven't had iTunes Radio, but i am looking forward to the iPhone 6, especially if it comes in a 5.5" model. hopefully this will make some chinsy retailers reconsider accepting amex. that is my biggest gripe of amex. customer service is top notch. I've yet to see anyone use NFC to make a purchase. Granted, I live in a relatively rural area of New England, but even in metropolitan areas I visit (Boston, NYC) are people really clamoring for this feature? It takes five seconds to take a debit card out of my wallet and swipe it. Surely it will take much longer to pull out the phone, unlock it, open the payment app, wait for the connection, and confirm the purchase. 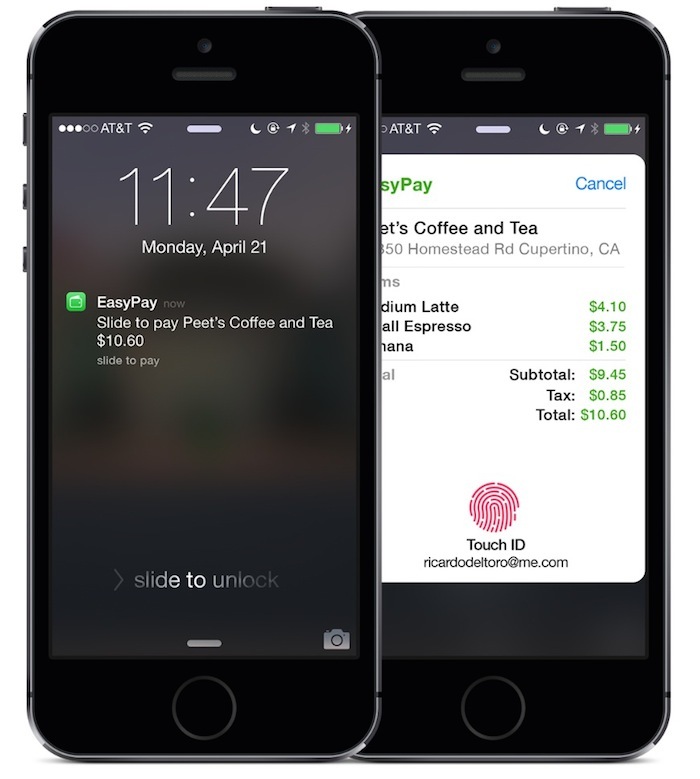 It would be even more convieniant to make payments with the wearable device. I don't know if I agree with the labels of "Smart" and "Wise" for your two types of people, but I like this saying. Still waiting for iTunes Radio in Turkey. Besides, the first Apple Store was launched in Turkey almost half a year ago but because of the law they still don't have the system in which every employee can take payments via credit cards. Turkish law still requires us to get printed receipts and the transaction to be conducted via POS machines. So I doubt this feature will ever be used in Turkey. On the other hand we have credit cards that are equipped with Visa fast pay that enables you to make payments less than $20 wirelessly by just getting your card close to the thing. I really wish this will be available and widespread though. I can see it get very useful.